How do we write about ourselves? What should we say? It’s just not English nature to do this! 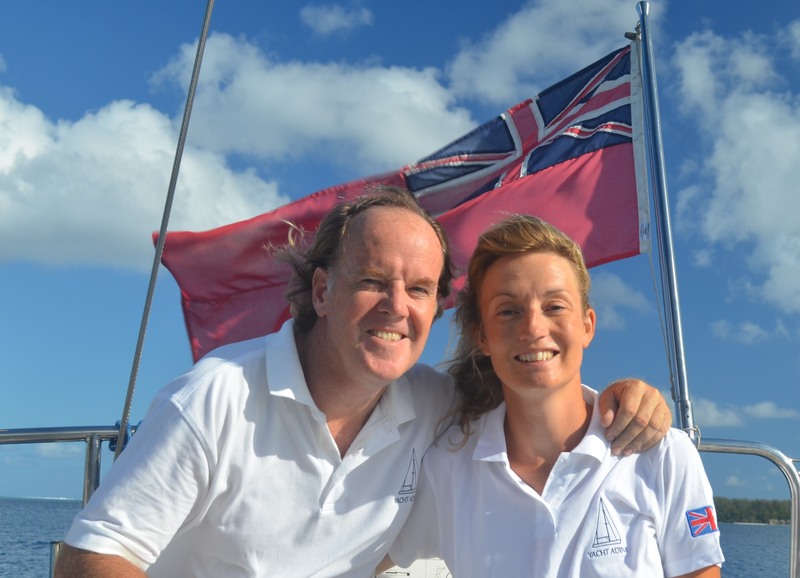 Let’s give it a go… Susie Plume and Tom Partridge met back in 2007 when Tom was organising a racing boat for our old sailing club in that year’s Hamble Winter Series. That soon extended to more sailing together, both in the UK and further afield. Time went on and soon we were discussing the idea of owning our own yacht and ‘living at sea’, as we coined it. 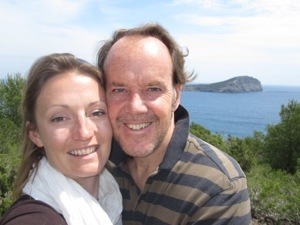 Given we both enjoy travelling one thing led to another and we bought Adina with the intention of sailing her around the world – in our eyes, the best way to travel as we would see the world from our own home! We’ve been really pleased with how she performs on the water and as our boat ownership has progressed, we’ve both got to know not only Adina but also our own strengths and weaknesses. We have a philosophy that we both need to know how everything works and both get stuck in, but at the same time we’re aware of what we each really enjoy and what we each like less, so when it comes to crunch time we go for our strengths. Susie certainly has more patience than Tom, loves problem solving and is one superbly organised lady – everything has a home on Adina! Tom is an ideas man, never afraid to dive in at the deep end and loves researching – whether it is how something works or seeking out that elusive destination to visit. We try to help each other learn and we are lucky our natural skills complement each other. We both have a love, as do many, of good food and wine. Tom even did a wine and spirits diploma for fun and, as many who have sailed with us know, the day will simply not start without a decent coffee. Susie has enjoyed having the time to build her cooking skills on board, always making sure any guests are well fed. Our favourite evenings are at anchor with fresh food cooked from local ingredients accompanied by a good bottle of wine, all shared with good friends or family. Our home on land is in Chelsea in London, England. And we do love London. It’s never dull, never quiet and always fun! We look forward to more time there in the future. We’re very grateful for this opportunity to take some time out and see the world, indeed even a little humbled, a little lucky. And it’s not just us who got this show on the road and keeps it moving in the right direction – many family and friends have freely given time and provided a huge amount of support to enable us live our dream. To those – we acknowledge your massive on-going efforts and thank you kindly! Now then, we’re English and that’s more than enough about us. Gin and tonic anyone? Hey guys! I have never met Susie and it is probably25 years since I last saw Tom but I am proud of you both and I wish you bon voyage! I am useless at writing so apologies if that makes no sense. You know, I will find you somewhere in the world. Swim out to your yacht and enjoy some stories wine and food with you. Have fun. Stay safe. Ben. I’d like to learn how to look at the future like you, with lots of enthusiasm, hope and excitement. Enjoy your amazing adventure, I hope one day I’ll realise my dreams too…I have two. With love and I hope to see you soon, somewhere in the Mediterranean maybe?! Great effort by the way and I’m up for a gin and tonic any day! 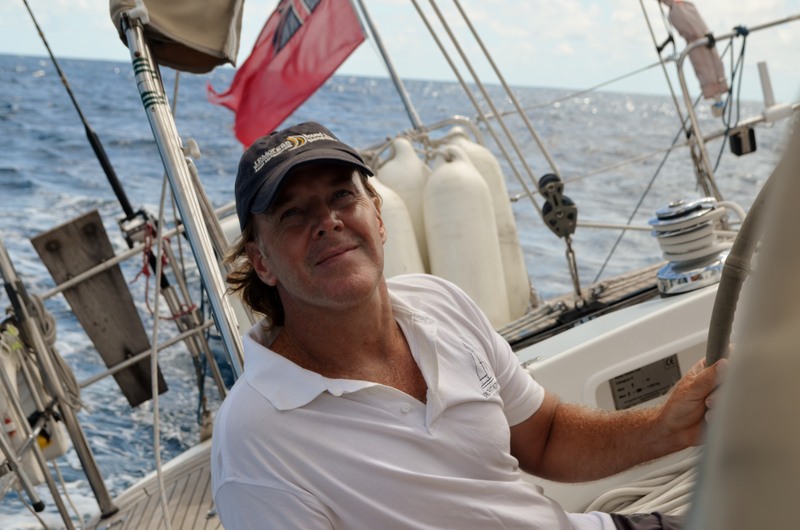 Can’t believe you guys are still in Blighty – hope the weather changes soon so you can hit the high seas! Looking forward to the updates from wherever you end up!! How is it all going? What an amazing adventure. We are looking forward to hearing the stories and seeing the pictures as you progress through your trip. We wanted to let you know we were thinking about you and wishing you both safe travels. Number 1 tip for the trip, buy lots of cans of fabadas, they’re amazing!! A year ago my sister announced she wanted to go to the Galapogos with all the extended family to celebrate her 50th birthday. The plan developed and 12 of us arrived on the islands on the 11th April for a 7 day voyage inboard a 90′ power cat. We have all sailed most of our lives and have a Jeanneau DS54 currently based near Barcelona and have always planned to sail further afield and “cross over” using the ARC. On my return from the wonderful islands I started to research the ARC and came across Adina’s blog which I have read with great interest, and while reading I realised that, having an eye for a pretty transom I photographed Adina leaving the Isabela anchorage on the 12th April……such a small world! I see you are now heading due west making good progress, I will continue to follow your travels with great interest and wish you all safe passage and maybe join you for a G&T another day! Thank you for the lovely comment – we tried to reply in the Marquesas but the internet lost our response! We loved the Galapagos and will return one day to see more of it – probably on a boat that gets to see more places that sailing boats are allowed. Go for the ARC – we loved it as did everybody you did it. They’ll help you prepare as best as you can. 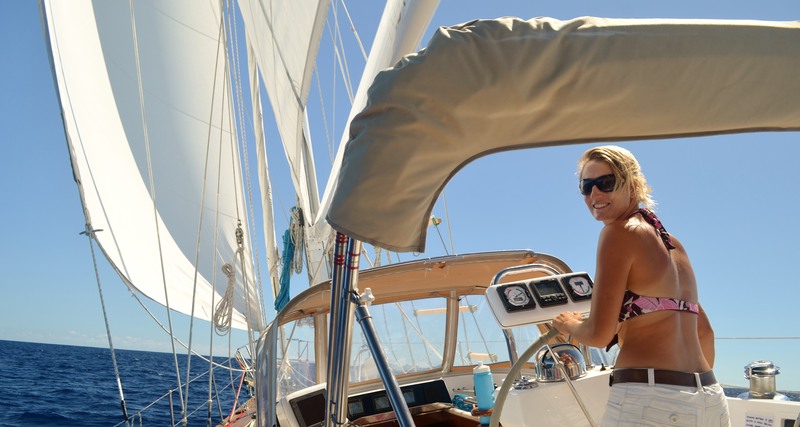 In the mean time, happy sailing – and yes, would love to meet for a sundowner G&T one day! Especially in Spain one of our favourite spots – miss the tapas! Found out about your amazing voyage from the Habs Old Girls newsletter. Are you planning to visit New Zealand? If you end up in Christchurch/Lyttelton and fancy a proper shower/ need to use a washing machine, please get in touch – my sister, (ex Habs 1990) and I, (ex Habs 1992) both live here with our families. Hi, what a fantastic adventure, enjoyed reading your Panama crossing in Yachting Monthly. Congratulations to you both. Are you heading to Brisbane? (it is beautiful here!!) I plan to sail the Mediterranean with my family in a 40 footer and would love my partner to hear of your experiences. Would love to catch up. Am happy to help out with a few things of course, we have a car. Cheers and happy sailing. Have just had dinner, well a curry, with your Ma and Pa. Susie, brilliant, golly congratulations to both you and Tom. A while ago I know but have lots of fun with your continuing adventures, is it really four years. Stay lucky J and A , C. (One of your Pa’ s Ballooning chums and his misses. P.s. Once had an interest in something called Northern Sailboats! Nowt to do with your present hosts though.